Each week there are a range of activities including fighter practice, fencing, dance and arts and sciences. These events are informal, and run in ‘mundane’ clothes. No special equipment is needed to begin with. Here are the events held at River Haven and nearby cantons/ baronies and shires. Please ensure that you check the details at the individual Canton/ Shire websites as these are maintained by separate members and are more likely to be up to date! Looking to authorise, re-authorise, or brush up on skill and technique? Regular educational workshops and talks. Activities will be announced on the list. Monthly meetings for officers but anyone is welcome to come along. 7:30pm – 9:00pm on the 4th Wednesday every month. The following events and dates are considered “protected” within the Barony and its Cantons/Incipient Cantons, and College. 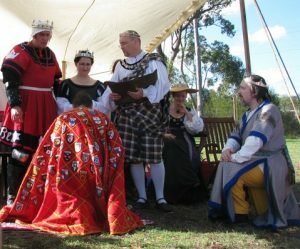 These dates are reserved for these events only and No other Baronial group can book a conflicting event without prior permission from the Event Steward, AND the signing Seneschal or Baronial Seneschal. The only exception to this rule is for the March and September Baronials where the Baron and Baroness only can make these authorisations.